Welcome ladies to the Watchu Experience! Most of Philmont's participants are male but each year there are more and more female campers and staff members. There are a number of items unique to women we want to try to help with so that each of you has a great backcountry experience. The information on this page is extracted directly from the Philmont Ranger Fieldbook. This segment was written by Philmont women for women. We realize some of this can be sensitive in nature so we do not publish this page for general viewing. If you have additional questions please contact Chief Watchu for the name and contact information of an experienced female staff member who can provide discrete and private coaching. 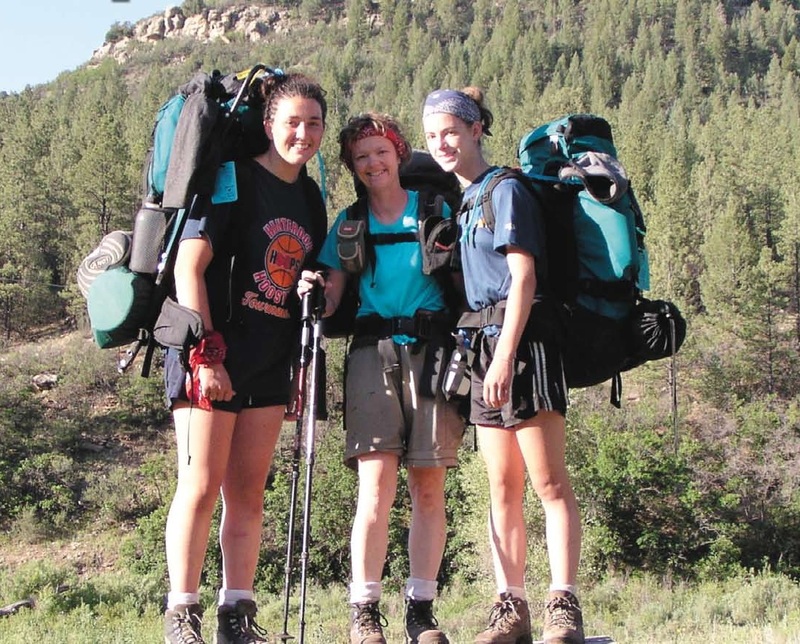 This section contains ideas, techniques and advice for the female trekker at Philmont. Whether in base camp or the backcountry, it is important to know extra precautions you must take to keep yourself healthy, clean and safe. Please approach your Ranger with any further questions and if they cannot answer you, they will find someone who will. No question is too big or too small. Have great trek ladies! Urinating in the Wild - Be sure to keep your pants at your knees and not at your ankles and watch the wind. Urine should hit dirt or rock; avoid urinating on trees or their roots. This is to prevent wildlife from damaging the trees when they lick the salt left behind from evaporation. You have the option to not wipe or to use a bandana (aka the wee rag) or standard toilet paper (1-2 squares). If you use a bandana, tie it to the back of your pack and the sun will dry it out and the UV rays will help sterilize the rag. Remember urine is sterile when it exits the body. Squatting positions and assists - When squatting, imagine you are sitting back on a toilet, only now you have to use your legs to hold you up. Best way to practice is to hover above a toilet. You can also hold yourself in a tripod position by placing one hand on the ground behind you. You can also brace yourself by leaning on a rock or dead tree (remember no live ones) or tripod using a dead tree or rock. The funnel method - Jealous of the guys standing up and not having to bear all to urinate? There are funnels, also known as Female Urination Devices (FUDs) which allow you to urinate while standing with your pants up. There are disposable funnels, but a solid reusable one is good because it is multi-use and therefore takes up the smallest amount of space and weight and is easily disinfected. (Lady J, Freshette, Shewee, Whiz Plus, iPee). The poncho - A cheap lightweight poncho works as a traveling outhouse, also handy if you need to pee in the rain (but ponchos should not be used for raingear). When using exposed latrines, known as pilot-copilot or pilot to bombardier (P2B), the poncho provides cover even in the most exposed areas. As a note, do not urinate in a latrine if you can help it. Urine slows down the breakdown of feces and creates a unique smell. Also, hygiene products are ALWAYS packed out.. There are two main reasons: 1.The products do not break down quickly, 2. The smell may draw wildlife into the area. Pooping in the Wild – The positions are the same as urinating in the wild. Dig the hole approximately 6 inches deep. After defecating and cleaning with the paper, add dirt to the hole and mix it in with the feces using the stick. The crew shovel should never come in contact with feces! Adding the soil will immediately eliminate any odors. Mixing the soil, feces and paper together into a "poop soup" will facilitate the decomposition of the feces and the paper. Once you have used up all of the soil, replace the top cap and insert the stick so that someone else will not dig in the same area. Also follow Leave No Trace guidelines as explained on their web site. NEVER use latrines for the sole purpose of urination. The salt in the urine will act as a preservative, increasing the decomposition time for the feces. Also, any urine that gets on the latrine will attract animals. In many latrines, you can actually see where animals have chewed the seat area. The look out(s) – When you need some privacy, let the crew know to hike ahead for a bit and then you can hang back with a buddy or two. They can keep an eye on the trail while you take care of business. This also works for watching the trail to a latrine. Don't be afraid to have your crew leader ask for a campsite that allows for a sheltered view of an open air latrine. Menstruation in the Wild - Bring enough supplies to handle having your period on the trail and be prepared to pack everything out. Being at altitude can throw the timing off a regular menstrual cycle so bring supplies just in case. Cramps - Be sure to have medications on hand which allow you to minimize or control your cramps. Tylenol, Ibuprofen, or whatever works. If you want to use heat to manage the pain there are single use heat pads which are available for purchase. A subtle way to pack is to use the hand or foot heat pads. Storing supplies - store an amount of toilet paper, two or more ziplock bags, and supplies to manage you period in an opaque toiletry/cosmetic bag. This bag should go with you anytime you have to "poop" and should you keep the toilet paper stocked in your private kit, the males need never know if you really need to poop or need to change. Should you find that more supplies are needed, there are tampons and pads available at the trading posts located at the commissaries on your trek. To help neutralize the smell of your dirty supplies, crush an aspirin or two and place them in the disposal bag. Another option for smell is one or two dry tea bags. For nighttime needs, either place the personal bag in the oops bag or keep one pad or tampon in your boot in case of night time needs. If you choose the boot option, the boots should go outside of the tent. If an overnight change occurs, the dirty item needs to go up in the bear bag. Some ladies have used small squares of precut foil to wrap dirty supplies. Some troops in the past have used two small ditty bags for each female. One was for clean supplies and the other for dirty. Bears and mountain lions will not come to camp because of your smell. There is no recorded case of a predator on Philmont attacking a menstruating female. The point of these procedures is to minimize the concentration of smell, minimize the chance of animals investigating the smell, and prevent animals from digging up waste products. Pads & Tampons - Please do not use fragrant supplies. Use whatever style you are comfortable with, but keep in mind that if you do not pack enough, there is little selection at the backcountry trading posts. Menstrual Cup - When first trying this it is advisable to wear a pad (at least a thin one) until you are comfortable and consistent with the placement of the cup. It does feel odd at first, but should not be painful. This option creates the least waste, but takes the .most amount of time to get used to. Minimum recommended time to adjust is 3 cycles. This should be an option you are comfortable with prior to hitting the trail at Philmont. Birth Control/Hormone Therapy - If you are already on birth control, you can try timing the medication to reduce the chance of a period on the trail. Do not start birth control just to control timing for Philmont. This also takes some advanced planning, please speak with your doctor. Underwear - Underwear should be breathable to discourage bacteria growth and rashes. For examples check out Athleta, Title Nine, Asics or Google "women's athletic underwear." Some past Philmont participants have suggested compression shorts. Washing - There should be at least one opportunity to shower during your trek; keep showers short. Bandanna baths can be taken daily. These can be done with or without soap. Privacy, if washing at the sump, can be given by wearing a poncho or using a fly or tarp held by watch outs facing away. A spray bottle may be used. Others have recommended wipes, which are a smellable and should always be put in the bear bag (used and unused alike). The areas which should be washed to minimize bacteria are pits, chest, and privates. Hydration - Being clear and copious is key to health in the backcountry. Having enough water in your system will reduce the effects and chances of altitude sickness and UTIs. Jewelry - You might want to leave rings and such in basecamp as there is not only an chance of losing them on the trail, but the altitude can cause fingers to swell a little and you don't want to have a ring feeling tight or unable to come off when it's uncomfortable. Shaving - Should you feel the need to shave your legs or anything else, do it before you hit the trail and when you return. The amount of hair which grows during the trip will not bother the males out for the hike, and also means you don't have to carry a razor or worry about the weight of shaving cream/gel. It also means less water used while in the backcountry. Make up - Extra, unnecessary weight and a smellable. The staff and males on the trip will not mind the absence of makeup. Skin creams or acne treatment should only be used before 4pm so night time treatment will not be allowed because we don't want you going to bed as a smellable. Deodorant - The biggest problem with deodorant is that it is a smellable. Yes, we can put on sunscreen, lip balm and bug spray and use wet wipes, but the big difference is that those all sweat off or rub off throughout the day. Deodorant and antiperspirant are designed to absorb in the skin and stay there. When you shower you have to use soap to get deodorant off. This really poses a problem when it is still on your body when you go to sleep. It is basically bear candy. Deodorant and the deodorant stones are not allowed on the trail, no excuses.